Handling the death of a loved one is never an easy task. We have put together some of the important information you will need to make the initial decisions and begin the process of designing your loved one's services. Remember that, as you begin to cope with your loss, it is often beneficial to enlist the help and support of a trusted friend or clergy in making the necessary arrangements. If you have any questions about your next steps, the options available to you, or what the funeral arrangement process will entail, we will be here to listen and walk you through this information in more detail and answer your questions. Do not hesitate to contact us for anything you might need. When a death occurs at home, you need to contact emergency personnel and call 911. Depending on the circumstances, the coroner or medical examiner may begin an investigation. If your loved one was under the care of home hospice, notify the hospice, and they will make the death pronouncement and call the funeral home. When a death occurs while your loved one is in a hospital, care facility or hospice facility, the professional staff will notify you and contact the appropriate authorities. If you have given them the name of a funeral home, the facility will contact them as well. The next steps involve registration of the death, and the processes and documentation involved depend upon the circumstances. The funeral home will help to guide you through obtaining a medical certificate and the appropriate registration procedures. If you are ever unsure of whom you should notify or what your next steps should be, please call us for assistance in determining the appropriate course of action for your particular situation. After you have taken care of the initial necessary arrangements, you will want to notify friends and relatives of the death. If it is too painful for you to do this yourself, it is fine for a trusted friend or family to make the calls in your place. Next, take time to review any prearranged wishes or plans your loved one may have put in place and meet with the professionals at the funeral home to discuss your options and begin planning the funeral. Do not hesitate to contact us with any questions you might have about what you need to do, even if your concerns are not directly related to the funeral. We are well-versed in all topics relating to the loss of a loved one, and we would be honored to provide you with answers, advice, and guidance in your time of need. 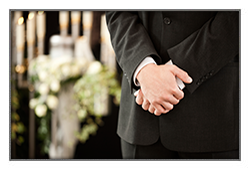 Your initial call with our funeral director will allow us to inquire about any prearrangements and gather the information we need to transport your loved one to the funeral home, but you can also feel free to ask any questions you may have and resolve any of your initial concerns. At a later time, you will be able to discuss your arrangements in greater detail with the funeral director, but we are always available in your time of need to provide emotional support, a sympathetic ear, and careful guidance. What If There Are No Prearrangements? These questions are just a starting point, and you do not need to know the answers right away. Start thinking about your decisions and contact us to gain a better understanding of your options and discuss what might be the most appropriate solution for your wishes. We are here to make this process easier for you, and we can start by making sure that you have all of the information and guidance you need. When you meet with a member of our staff to discuss your arrangements, we will first provide you with a general price list to give you a basic idea of what our services cost. We will then walk you through the entire arrangement process and ask you about your loved one to gain an understanding of the person the services will honor. Use this time to communicate your ideas and preferences, share your loved one's life story, revisit memories and highlight their accomplishments. Our professionals will use this information to guide you in the creation of a personalized, meaningful celebration of your loved one's unique journey. To help express your loved one's personality and life story, feel free to bring any memorabilia - like photos, music, crafts, or treasured items - that might give us a better understanding of how you envision paying tribute to your loved one. Even if you are not sure how a particular aspect of their life might be incorporated, do not hesitate to ask; we can often make unique suggestions on a way to add that element as a special touch to their service.